Pamela Pruitt honoring female athletes at the “Celebrating Women in Rider Athletics: A Reception in Their Honor” event on March 25 in the Student Recreation Center Seminar Room. Female athletes from both past and present attended the “Celebrating Women in Rider Athletics: A Reception in Their Honor” event, sponsored by Rider Athletics, Rider Women’s Basketball, the Center for Diversity and Inclusion and Alumni Relations, in an effort to celebrate Women’s History Month and honor female athletes on March 25 in the Student Recreation Center Seminar Room. Pamela Pruitt, director of the Center for Diversity and Inclusion, praised the athletes in attendance for their ability to spark empowerment in women across campus through their sportsmanship, academic achievement and participation in community service. 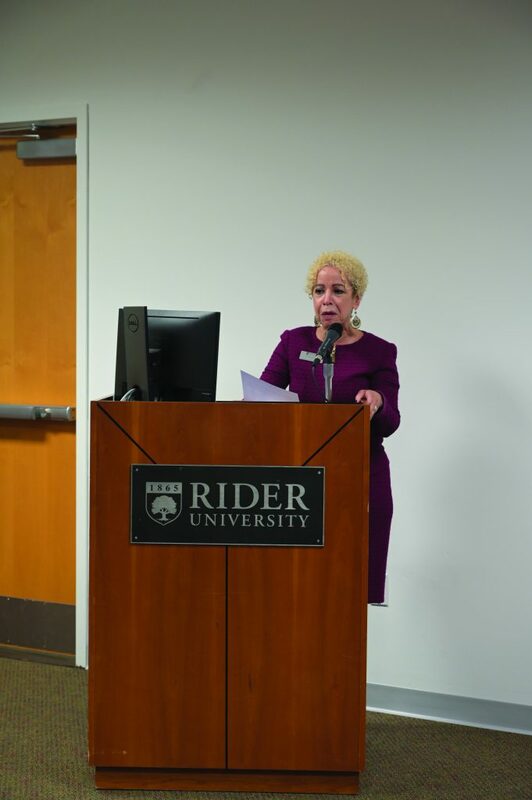 President Dell’Omo then took to the podium to emphasize the importance of women in Rider Athletics and to highlight the achievements of current student athletes in their prospective sports and academics. Dell’Omo then thanked the athletes for their commitment to their sports and Rider. Lynn Milligan, head coach of the women’s basketball team and former Rider student athlete, introduced the keynote speaker, Jennifer Dahl Hines ’97. Hines, a member of the Rider Athletics Hall of Fame, was a former pitcher for the softball team. She is a two-time Northeast Conference Tournament MVP, won two championships during her sophomore and senior years and still holds the record for most wins in a season. Hines reflected on her time at Rider as a student athlete and member of the softball team. She shared stories about her friends, teammates and memories that ultimately shaped her future and career. “What I had no idea about at the time was how ahead of the game and prepared for the future I already was,” she said. Hines is a seventh grade Life Science teacher and a graduate assistant pitching coach at La Salle University. Awards for community service, leadership and academics were presented to current female student athletes, teams and club sports.